Let’s chug along into learning fun with this VTech push and ride alphabet train. 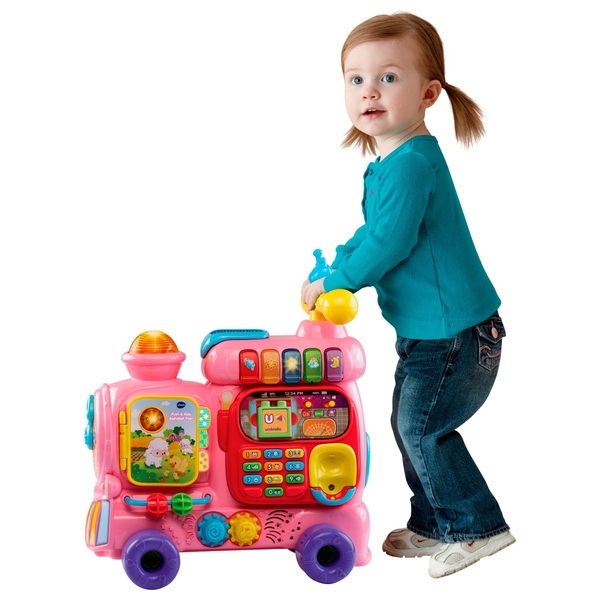 This 4-in-1 VTech grow with me alphabet train includes modes for sit- down play, a walker, a pull-along wagon and a ride on. Includes 13 double-sided letter blocks and a magic tunnel to load the blocks into the wagon, also features a removable walkie-talkie, a number pad, light-up piano keys, turning book and manipulative beads and cogs. Teaches objects, animals, phonics, letters, colours, weather, numbers and much more. EU Warning: Not suitable for children under the age of 1 years due to small parts which could cause a choking hazard.